WE NOW MEASURE THE IMPACT OF EVENTS! 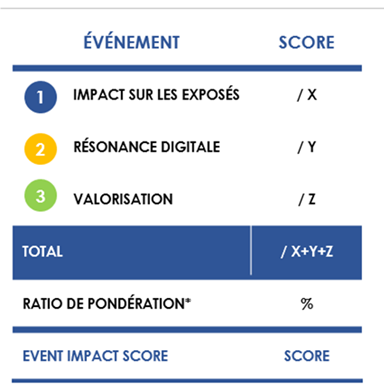 LÉVÉNEMENT AND NIELSEN HAVE DEVELOPED THE FIRST GLOBAL VALUATION TOOL FOR EVENTS : THE EVENT IMPACT SCORE ©. With the objective of better measuring the efficiency of events in mind, NIELSEN (global information, data and measurement company) and LÉVÉNEMENT (association that represents major French events agencies) have partnered to go a step beyond and to create the first global valuation tool for events : the EVENT IMPACT SCORE ®. The event industry is worth several billions each year no matter what country we live in. It has become crucial to measure and to quantify the impact of events, so that corporate decision makers can see the associated benefits. “We wanted to give the industry a credible tool that would allow to measure the value of event and to translate it into metrics. In this way, top management will better understand what events can bring to their communication strategy” said Arnaud PEYROLES and Thomas DELOUBRIERE, VPs and administrators of LÉVÉNEMENT, who have launched the project along with NIELSEN. “The need expressed by LÉVÉNEMENT to have a measurement tool to seize the efficiency of any kind of event shows that communication and marketing department are under transformation. This transformation puts data and insights at the heart of corporate decision making” explain Raphaël PROUL, Media Business Unit France Director at Nielsen, and Pierre-Emmanuel DAVIN, Managing Director France at Nielsen Sports & Entertainment. LÉVÉNEMENT is the event communication association. It brings together 65 event communication agencies. Among its main tasks: – Providing answers to the issues of the industry – Speaking in a single voice – Affirming the added value of our profession – Defending our shared interests – Promoting French know-how – Pooling resources based on the most important shared interests – Bringing together all industry stakeholders (agencies, clients, partners, institutional players…) – Achieving a stronger link between clients and agencies – Developing good practices shared by all, to permanently improve the efficiency of our collaborations. LÉVÉNEMENT also oversees Le Club des Partenaires de LÉVÉNEMENT, a network of event service providers, is partner of LéCOLE – The Event Thinking School. LÉVÉNEMENT, together with Viparis, Novelty/Magnum and Weyou, has become the founding partner of FRENCH EVENT BOOSTER, the first French innovation platform of the event industry, launched on the 20th of March, 2018. Nielsen Sports & Entertainment, part of Nielsen, is the global leader and independent trusted advisor in sports and entertainment intelligence and measurement. Combining solutions from sponsorship effectiveness to fan data capabilities with Nielsen’s understanding of consumer behavior and media consumption means Nielsen Sports & Entertainment is uniquely positioned to help businesses maximize their commercial success.